One reason that I appreciate KDE is that I am always discovering new applications. In fact, I make a point of regularly searching for them. My most recent discovery is Kile, a graphic editor for LaTeX. Kile is not the first of its kind, but, unlike the better known LyX, whose interface resembles a word processor, it makes no attempt to hide the structure that shapes the output. Instead, like the Bluefish editor, it is what I think of as a semi-automatic editor. Instead, users add markup from a list of options in a display in which tags are visible. With this approach, Kile eliminates the drudgery of typing markup while making both troubleshooting and the learning of LaTeX easier. 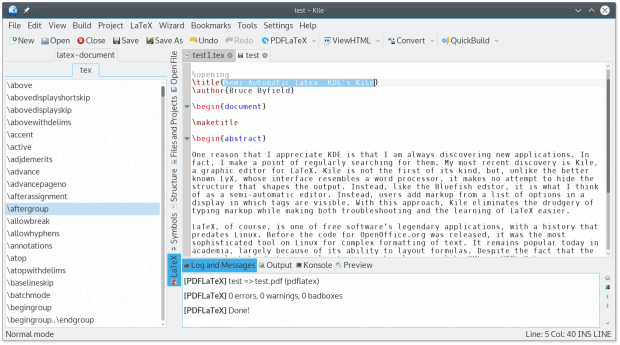 LaTeX, of course, is one of free software’s legendary applications, with a history that predates Linux. Before the code for OpenOffice.org was released, it was the most sophisticated tool on Linux for complex formatting of text. It remains popular today in academia, largely because of its ability to layout formulas. Despite the fact that the principle behind it is similar to any markup language like XML or HTML,X has a reputation for being difficult to learn. The main difficulty, though, is not so much in the basic concept, or even the fact that tags are not in pairs so much as finding the right markup or extension libraries among the dozens that are available. One advantage of Kile is that it displays a thorough (although possibly not exhaustive) list of tags that are always available in the interface, so that users do not have to remember all the available choices. Kile’s editing interface could hardly be simpler. The left hand pane is a list of LaTeX markup options, either tags or symbols, depending on the display option An option can be clicked to add the current selection to the current cursor position in the upper right pane, which displays the document, tags and all. Multiple documents open in tabs at the top of the upper right pane, and different display options are available vertically on the left. You can, for example, toggle off Structure to hide the display of markup options in order to give you more space to view the document. While you work, the lower right pane remains blank. It is used only when compiling and outputting the document to a usable format. The Kile interface removes the drudgery of adding tags manually, but still allows you to view the document structure. To begin editing in Kile, select New from the toolbar and choose a document type. Selecting a document type automatically adds the preamble or top matter to a document that contains information that details information such as the paper and font size. This information can be edited as needed, and added to, either manually or by selecting Wizard | Quickstart to use a graphical interface. In addition, selecting the document type adds the \begin and \end tags required for all LaTeX documents, as well as those required by the document type. For example, a letter requires an \address, \opening, \signature, and \closing section, each of which should be customized for each letter by editing the contents of the curly brackets. Choosing the document automatically inserts the required markup. You can then edit it to suit. You may also use the View menu to set word wrap, so that paragraphs can be viewed within the editing window without scrolling. Otherwise, the text of a paragraph is displayed in one continuous line, which is inconvenient if you are revising contents. Adding contents is generally just a matter of typing in the appropriate section, and hitting the Enter key twice to indicate the start of a new paragraph. In addition, you can add markup for accents, alignment, and other formatting. If you choose, you can designate sections to format some content differently from the rest. Selecting Wizard | Tabular can help with setting up tables. For convenience, documents can be arranged in projects. For longer documents, you may want to add bookmarks for quick navigation. As you work you can use the Preview option in the lower left pane to check how the current document will look. When you are ready to produce output, save the document and go to the Build menu. If you know the supported output format that you want, you can use the QuickBuild option. Alternatively, you can use the Convert sub-menu to select an output format. For general use, the PDFLaTeX or PDFTeX formats are probably the most convenient for average users. Most errors while compiling are likely to be a failure to define tags, which means that there is insufficient information for compiling. However, all errors will display in the lower right pane. You can use the Build menu to navigate to each error, which can be useful if the current document is too long to scan manually. If necessary, keep compiling until no errors are listed. By default, the output file is in the same directory as the original saved file. Unless you have chosen other options, your paragraphs will no longer be separated by a double line, as in the input file, and instead will each have an indented first lined and no extra space between them. Kile is not particularly designed for beginners. If you are new to laTeX and related text systems, you will probably need to experiment, making changes and then compiling so you can see results. The fact that Kile’s online help is entirely about troubleshooting does not make learning how to compose a document any easier, either. I suggest you start by using Kile with a page like the LaTeX wiki open in your browser, so that you have a quick reference. Better yet, make a list of the most common formatting options you want, and make notes about how to set them before you start to work. 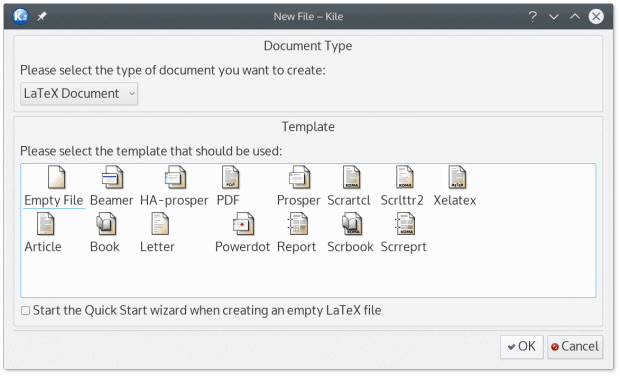 Once you start to use LaTeX, it can be surprisingly quick to learn — and Kile makes it all the easier by eliminating errors caused by typing tags and allowing you to concentrate on getting the formatting that you want. As I sometimes write in a mathematical and scientific vein, this appears to be highly valuable. I am, however a child of the times, and tend–nowadays–to take a ‘millennial’ (i.e., brain-dead) approach to new things (I’m convinced that NO one knows how to use 99++ percent of the capabilities of their so-called “smart-phones”). Having ‘paid my dues’ with the likes of MSDOS’s ‘edlin’, and classic ‘Wordstar’, I am dis-inclined to take on another one of those. You are obviously the right person for an explanatory article, and I think you would find a ready audience–in the right venue–for a more in-depth explanation of this tool; something along the lines of an amplification of the section above: ‘Writing with Kile’ .